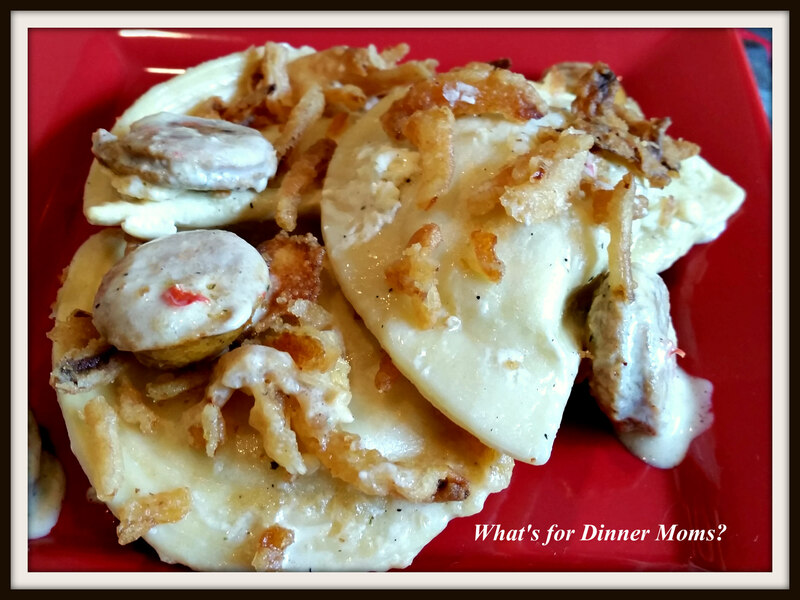 Pierogi and Sausage Casserole – What's for Dinner Moms? I first made this casserole over 2 years ago. I have reworked the original recipe into a one pan casserole that can be on the table in about 30 minutes! This meal was one of those, “Oh my goodness it is 30 minutes before dinner and I don’t know what we are going to eat meals.” Yes, we all have those days. Scouring Pinterest and trying to remember what we had in the freezer that I could pull together quickly I found 2 boxes of frozen Pierogis. Score! I could add some chicken sausages that I found in the bottom my freezer. Yes, it is going to be a no-buy month for May! My freezers overfloweth so it is time to clean them out. I will buy fresh fruits, vegetables and dairy but nothing else. Time to challenge myself to see what I can make. My pantry shelves and freezer need a good cleaning so this is the time to do it. This was a good, solid dish. It wasn’t fancy or overly difficult to make. It was a nice dish to make when we are in a hurry and needed to get dinner on the table. This dish has great flavor and it is easy to customize. You can change the chicken sausage to any flavor your family will like. Don’t like chicken sausage? Use any non-fatty meat you like. Diced ham or chicken breast pieces would also be good to try. French fried onions add a great flavor to this dish. But, if you have a family that refuses to eat onions you can use Panko bread crumbs. Also, add more or less garlic powder and black pepper to what your family will like. I served this with a green salad and a side of carrots to complete the meal. Preheat oven to 400 degrees. Lightly spray 13×9 baking dish with non-stick cooking spray. Cut the cream cheese into small pieces and scatter them in the bottom of the casserole dish. Pour the chicken stock into the pan. Sprinkle the garlic powder and black pepper over the mixture. Place pan in oven for 5 minutes. Remove pan from oven and stir the sauce mixture until the cream cheese is melted and smooth. If needed return pan to oven for 1-2 minutes to melt cream cheese. Add the frozen pierogis and chicken sausage to the casserole dish. Stir well to coat the pieces. Return pan to oven for 25 minutes. Remove pan from oven and sprinkle with French fried onions. Return pan to oven for 10-15 minutes until onions have browned and pierogis have started to brown. Allow pan to set for 3-5 minutes before serving. Just had my first, handmade by my polish neighbours, pierogis this week! Love it! I’ll have to try your recipe for sure! Thank you! Frozen pierogi are not as good as fresh homemade but we like them in a pinch. Hope you like it too! Great use of what you had on hand! I’m sure it was delish! I adore pierogi! My wife is a second generation Polish-American and she got me into cooking these. Thanks for the insights! Pingback: Grilled Pizza Margherita with Balsamic Drizzle – What's for Dinner Moms? So much good food, so little time.